Atmosphere: The small, low-ceilinged bar area is lively in a low-key, sophisticated way. The decor is sleek and subtle to a fault, but the lighting is warm and the drinks, food and service are so good that your surroundings fade into the background. Chef-owner Barbara Lynch deservedly gets a lot of accolades for her food (she’s consistently rated among the Northeast’s top chefs) and her business acumen (her No. 9 Group now includes two other successful restaurants, B&G Oysters and the Butcher Block, plus catering and produce outfits). But no one has trumpeted the way Lynch advanced mixology in this town by staffing No. 9 with bartenders who are as serious about cocktails as she is about food. Until now, that is. It seems that a lot of chef-restaurateurs try to foodie-up their drink menus to match a style of cuisine. “Hey, I’m doing pan-Asian food, so I’m going to have my bartenders mix cocktails with lemongrass and ginger.” This practice tends to involve a lot of drinks made with vodka, which serves as a blank canvas for trendy flavorings. Instead, Lynch hires talented people and lets them do their thing. The bartenders are well versed in the wide world of classic cocktail ingredients — spirits, liqueurs, bitters and vermouths, plus egg whites, juices, syrups and other mixers — and they know how to combine them to create a drink that can stand on its own and complement your Gorgonzola Fondue. Other perks of No. 9: you always get a taste of wine before you commit to buying a whole glass, and there are some fine items on the beer list, like Boon Gueuze from Belgium, Trois Pistoles from Quebec and Schneider Weisse hefe-weizen from Germany. The service is attentive but not overbearing, and the bartenders know the trick of creating a sense of community at the bar without intruding on any party’s privacy. The drawbacks of No. 9? You will drop some pretty serious cash here, but what did you expect for this level of quality? Cocktails range from $9-$12, wines by the glass from $7-$16, and beers from $4-$10. So, for a couple of cocktails, an entrÃ©e from the bar menu ($17-$24), and a glass of wine with your dinner, plus a 20-percent tip, expect to spend around $70. The other drawback? The bar has only a dozen seats. Find something to celebrate on a Tuesday night and get there early. I ordered Mai Tais at two different places this week: first at Eastern Standard (Kenmore Sq. ), then at Peking Tom’s (Chauncy St. near Downtown Crossing). A Mai Tai would be just another sweet rum punch if not for two mysterious ingredients: Orgeat and falernum. What and what? you ask. Read on. The milky-colored orgeat (pronounced OR-zha) is a “generic syrup of almonds, orange flower water and sometimes barley water often used in tropical and other cocktails,” according to the Cocktail Database. You may have seen orgeat at one of those coffee houses where they mix flavored syrups with soda water. The database describes falernum as a non- or lightly alcoholic sugar syrup with a “subtle sweet/tart/spicy character” and “used almost exclusively in rum-based tropical drinks.” These ingredients elevate the Mai Tai — otherwise made of light and dark rum, lime juice, orange curacao and grenadine — from a drink for girly-girls to a drink you’d buy for the Girl from Ipanema. Both bars serve the Sweet Tart-pink cocktail on ice in the traditional double rocks glass. The Peking Tom’s Mai Tai ($7) was yummy, but Eastern Standard’s ($10) was better. I suspect that the former omits the falernum, as that ingredient is hard to find and usually must be mail-ordered. Eastern Standard mail-orders several hard-to-find ingredients, like orange bitters. Its Mai Tai wasn’t as sweet as Peking Tom’s, but it had more going on, including a candy note that reminded me of Smarties. Whatever happened to the portable bar? We bought this vintage booze suitcase for about $35 at the Cambridge Antique Market and brought it with us on vacation in Cape Cod. Not surprisingly, it’s called the Executair 101. 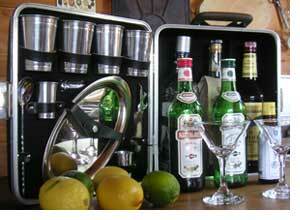 It comes with four mixing cups, two jiggers, a mixing spoon, and a serving tray, all made of space-age aluminum. Since cocktails in most Cape bars are of the sweet, “island” variety, we made frequent use of the Executair in whipping up Manhattans and Martinis come five o’ clock. I’m not exactly a youngster, but I don’t remember that Golden Age of Drinking when it was OK to bring your own bottles and mixing equipment around with you. The great thing about the Executair 101 (I’m dying to find the 201 model in hopes that it added a strainer) is that it really does look like something you could bring to the office. And if your boss was a very special man or woman, you could open this baby up in a meeting and be instantly promoted. If you want proof that tending bar isn’t an entirely lost profession — that it isn’t just a temporary gig for any aspiring musician or lawyer who can combine vodka and tonic and say they know how to mix drinks — go to the bar at No. 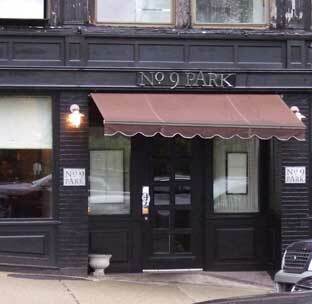 9 Park and watch the John Gertsen Show. You will see a boyishly handsome, kind-eyed man nimbly corral a barful of demanding Beacon Hill types while mixing drinks with the same level of care that a great chef takes in preparing dishes. 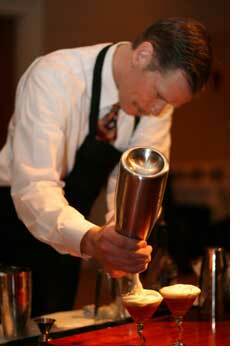 Almost every bartender that drinkboston.com has profiled has spoken admiringly of Gertsen’s expertise. “He makes me look stupid,” said one colleague, himself no slouch behind the bar. A scholar of late-nineteenth- and early-twentieth-century cocktails, Gertsen says his favorite drink to mix is a Ramos Fizz, a concoction of gin, lemon, egg white, and cream that, properly made, takes 15 minutes of shaking and chilling, shaking and chilling. To make sure he’s gotten a cocktail just right, he’ll draw a small sample into a straw and have a taste before he places the drink on your bar napkin. I grew up in Hanover, MA. I first started tending bar at Salamander Restaurant in Cambridge. My first drink was a sip of scotch on the rocks that I stole from my grandfather while we were watching The Price is Right. An absolutely horrifying experience for a seven-year-old at 11 a.m. The last one of the night. As much water as possible and a Brooklyn Lager. Broken glass in your ice bin. Spending the $30 that you would have spent on the Fung Wah [bus to NYC] on a meal to go along with your great cocktail here in Boston. The silly tradition of “last call.” I feel that last call encourages overindulgence and irresponsible drinking.